I cross the border from Cambodia to Vietnam nervously, ready to be ripped off at any moment, and frightened that I’m going to find my animal friends in every dish that I order. 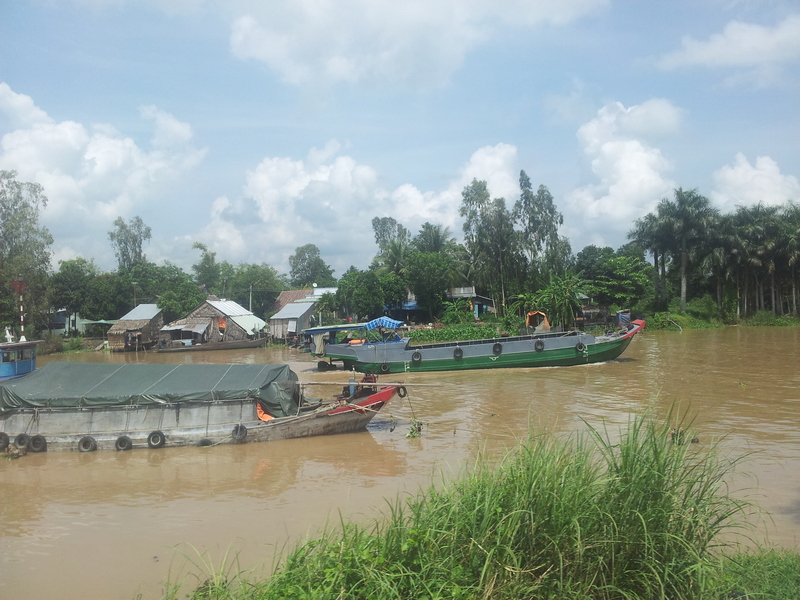 I first visited Vietnam seven years ago, and I have memories of scams and hostility towards travellers. I wondered why it was like this, and decided that with the history of the US invasion, why wouldn’t people act with hostility towards seemingly spoilt western backpackers? 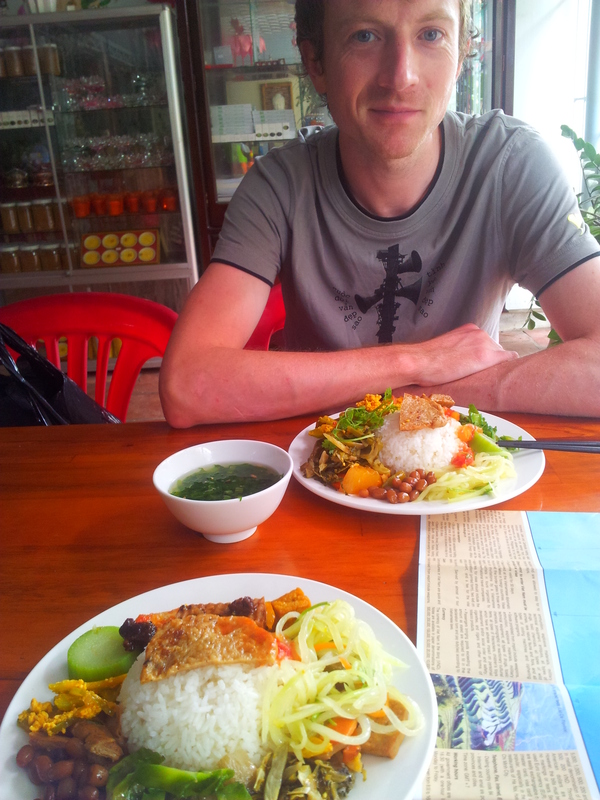 The only reason that I’ve returned to Vietnam is because my friend Conor lives here. Conor left Ireland on a trip across the world two years ago, and I last saw him in France, at the very beginning of his journey. 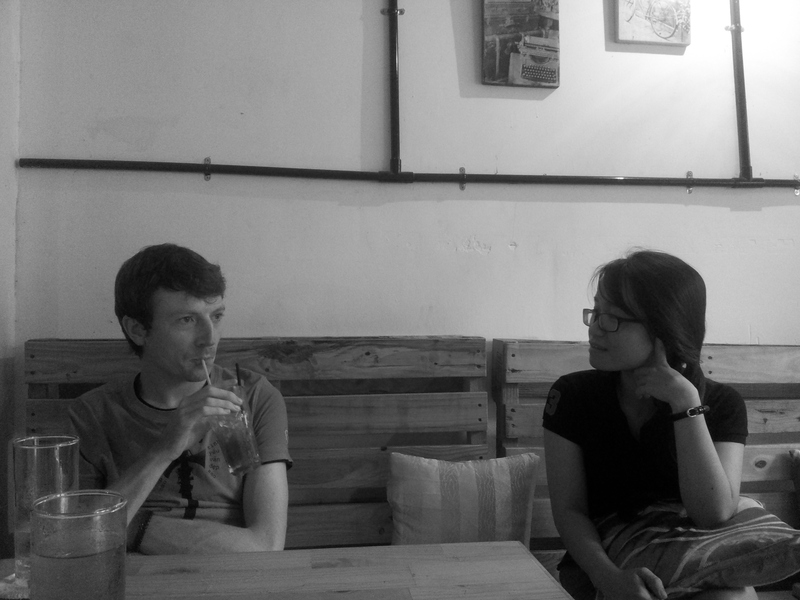 He’s been teaching English for a year in the city of Vung Tau, in the south of Vietnam. 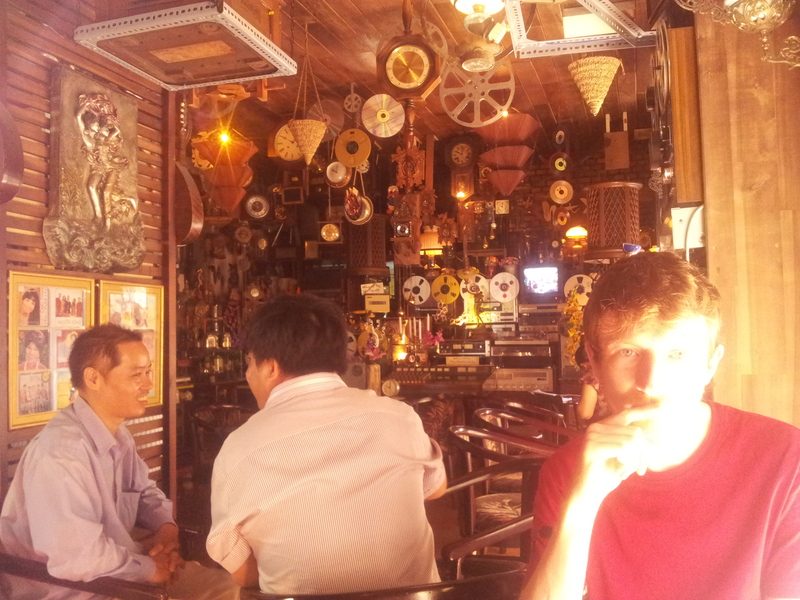 I can understand how Conor has lasted a whole year in Vung Tau. It’s a pretty place, surprisingly relaxing, and it’s really green! 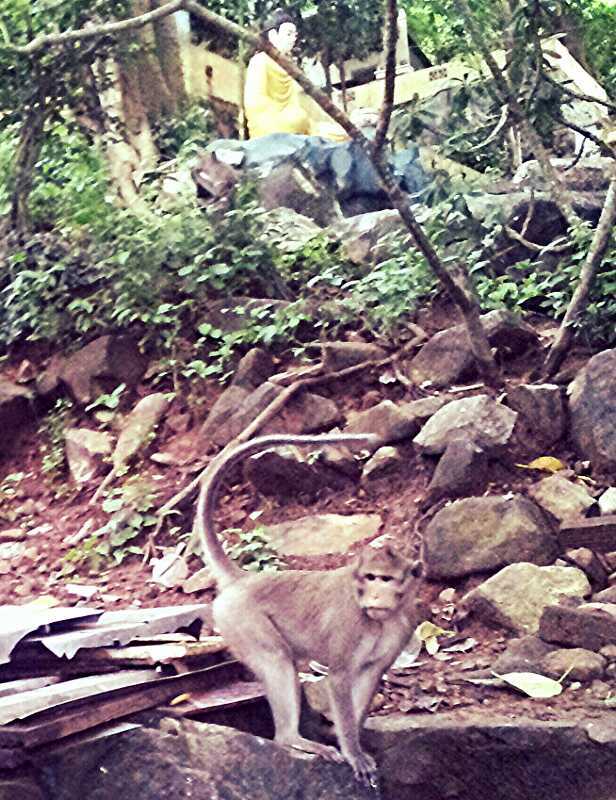 There’s forest in the centre of town and lots of macaque monkeys, who seem much more well-behaved than their brothers and sisters in India! 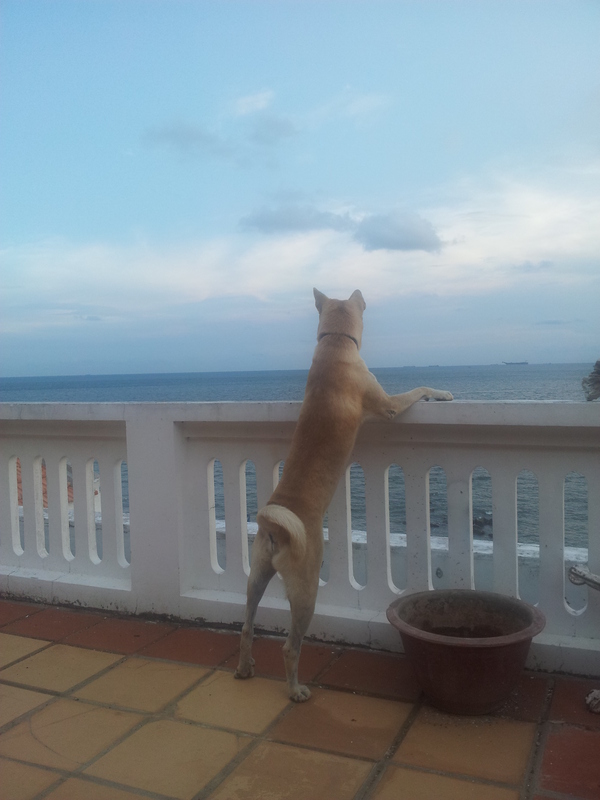 Vung Tau’s also really friendly. Everywhere, people smile and say hello. I walk past an old lady, make eye contact and smile at her. She laughs a huge, toothless laugh and her friendly eyes sparkle with amusement. I don’t care if she’s laughing with me or at me – I just feel so lucky to experience this beautiful connection, no matter how small. 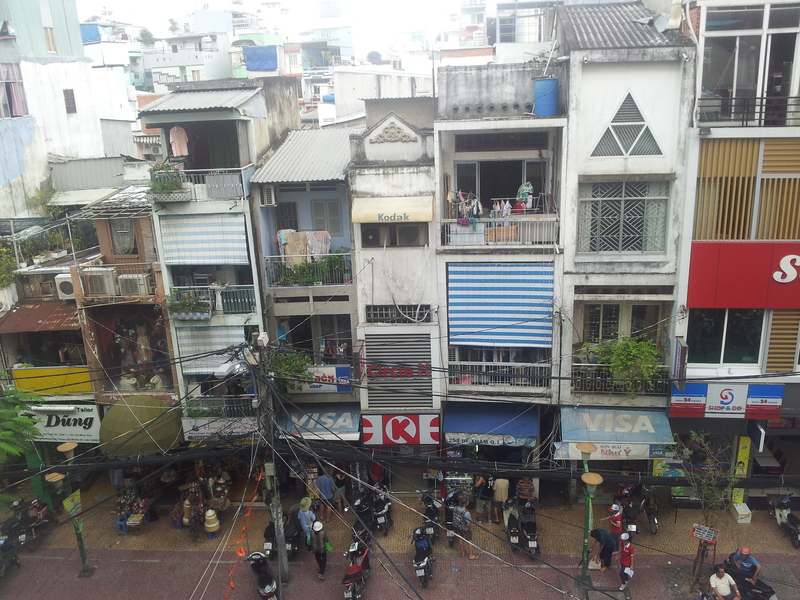 Vung Tau has its seedy side, though, and there’s many lone, middle aged European and Australian men living and visiting here. There’s an added feeling of wrongness because the city’s coast is littered with oil rigs. There’s lots of ‘girlie’ bars that exist for both the western men and the oil workers. Whilst I’m visiting, a giant spider decides to move into Conor’s flat. As big as my hand, the spider crawls out of the pipes and makes its home in the bathroom, sitting on the bath. “In my whole year of living here, I’ve NEVER seen a spider the size of this,” Conor says shakily, slightly unnerved by the giant sitting in his bathroom. I, on the other hand, was surrounded by spiders as big as this in the Cambodian rainforest just two days before. I wonder if there’s a giant spider vendetta against me, though…they seem to be appearing everywhere now…! We decide to catch the spider. Conor entices him or her towards me, and I scoop the spider up with a scream and lots of swearing. We put the poor creature outside, making sure that Conor’s next door neighbour, Leo the dog, isn’t around to eat him or her. Conor and I spend a few days swimming in the sea, eating vegan food and exploring the town, and I yelp with fright on the back of his scooter as he weaves through traffic like a local, paying no attention to the correct side of the road that he should be driving on. And then it’s time to say goodbye. “I’ll see you at home!” I say to Conor at the bus station, knowing that he will be returning back to Ireland in a month or so. On the bus, I think about what a transition and culture shock it’s going to be for him. Onwards I travel to Saigon (or Ho Chi Minh City). 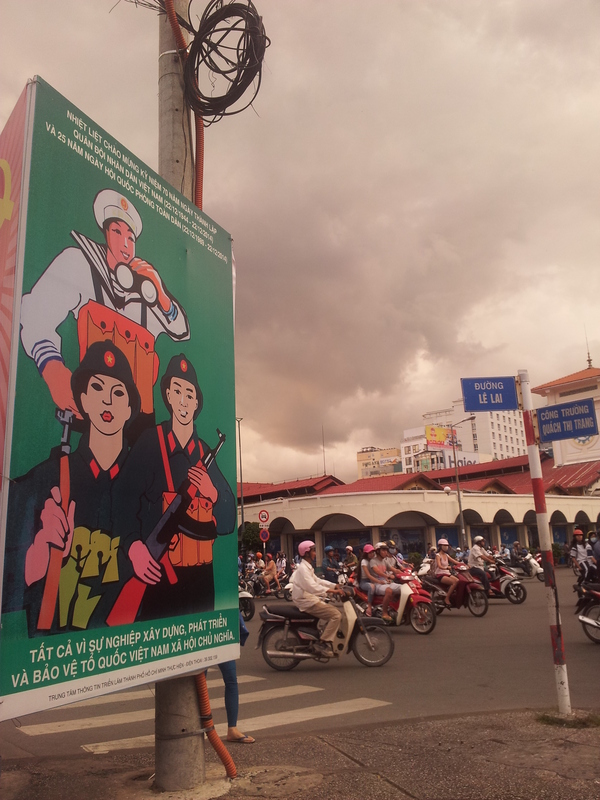 My memories of my first visit to Saigon are hazy. All I can remember is getting drunk in Apocalypse Now club (really! ), racing my friends on the water slides at Saigon’s amazing water parks, visiting the Cu Chi tunnels, and looking round the Museum of American War Atrocities (officially known as the War Remnants Museum). Seven years on, as a sober person, I discover that the city is also really welcoming, and like in Vung Tau, locals greet me on the street. 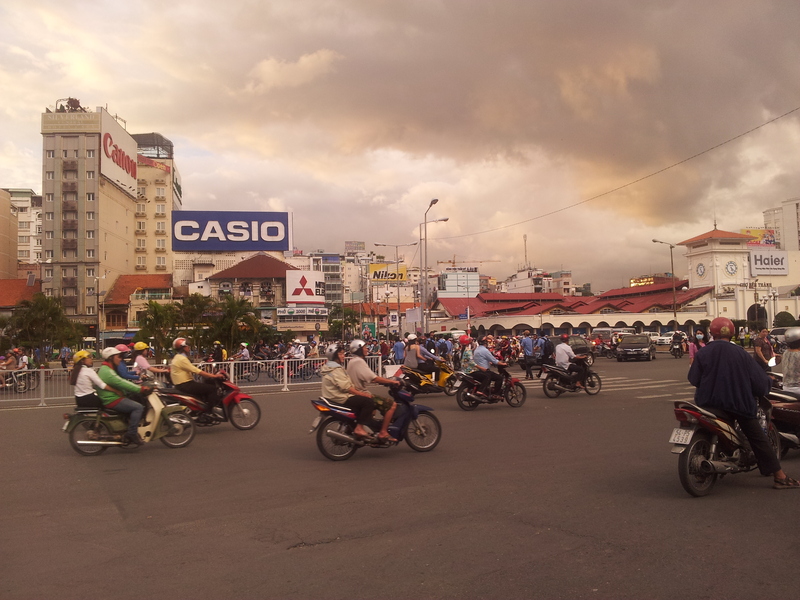 The traffic in Saigon is absolutely terrifying. The only place that I have visited with more terrifying traffic is Tehran. Last time I was here, I clung on to friends as we nervously dodged the onslaught of scooters. This time I am alone, and I stand in middle of the street, frozen like a frightened rabbit, as the traffic hurls itself at me. I cram in a few vegan restaurants in my short time here. Saigon’s got over 100 vegan-friendly restaurants listed on Happy Cow. “How did I ever have problems being vegetarian here? !” I wonder. The Vietnamese word for vegetarian is ‘chay’, and I see it on signs everywhere. I realise that the reason why it was so difficult to be vegetarian before was because I made absolutely no effort…I didn’t even learn the word ‘chay’. 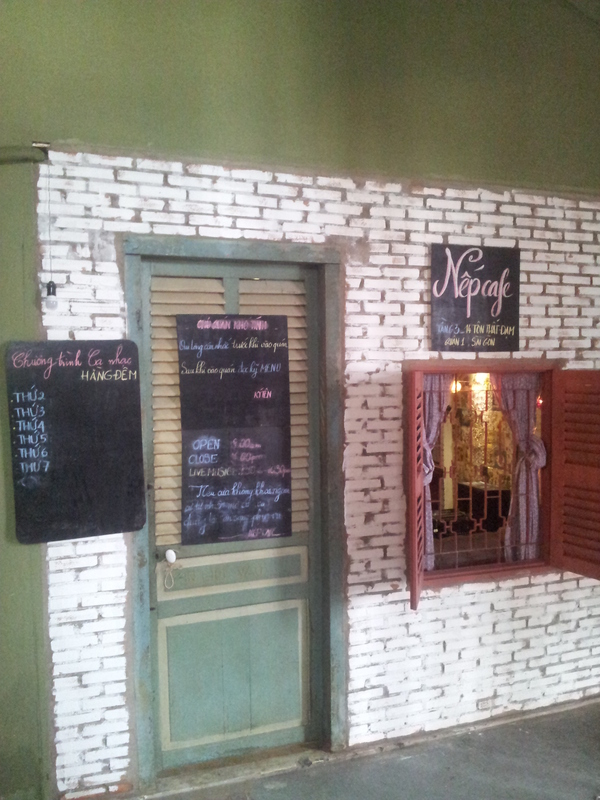 My final few hours in Saigon are spent visiting 14 Ton That Dam, a hidden, rundown building right in the city centre which is being used by creative people, who have set up cafes and second hand shops. It reminds me a lot of Berlin a few years ago. And like many cities (including Berlin), investors and ‘developers’ are completely changing the city at a fast rate, with a danger of many old buildings being demolished. 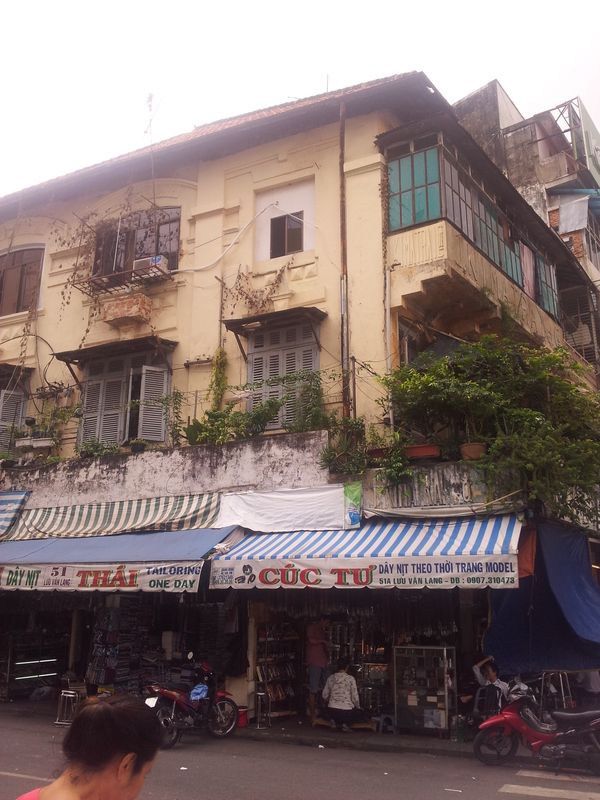 Read Conor’s account of living for one year in Vung Tau here. Read his harrowing summary of the US massacre of the Vietnamese people here, where 3 million Vietnamese were killed, and where napalm and agent orange were used on large swathes of Vietnam’s countryside. Wow, thanks for writing this Lisa. 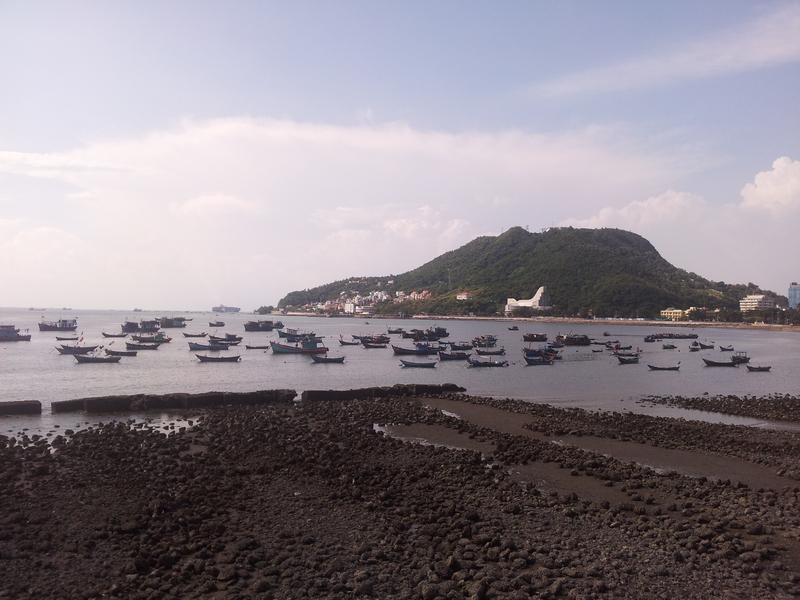 You capture Vung Tau beautifully. Reading this from cold, wintry Ireland has made me nostalgic for a place I just left a few months ago!